It’s been less than a year since astronomers detected seven planets around TRAPPIST-1, a remarkable star system located 39 light years from Earth. New research suggests life could take root on at least two of these planets, thanks to a fortuitous orbital quirk. But other scientists aren’t so sure, saying TRAPPIST-1 still has much going against it in terms of its ability to foster life. TRAPPIST-1 has more planets than any other system we know of outside our own. These seven planets, all of which are roughly the size of Earth, are in orbit around an ultracool M dwarf—a small, red star that gets no warmer than 2,430 celsius or 4,400 F, which is less than half the temperature of our own Sun. New research published in Astronomy & Astrophysics identifies two planets around TRAPPIST-1 as the most likely to harbor life, including one that may even feature a vast ocean of water. This red dwarf may be old and dim, but its seven planets (listed from b to h in order of their distance to the star) are parked in a relative close proximity to their host (a year on these planets lasts just a few days). Despite the close confines, the exoplanets feature relatively cool surface temperatures—at least by astronomical standards. Surface temperatures range from a balmy 260 degrees F (127 degrees C) to a chilly -160 degrees F (-106.1). These planets don’t sound very hospitable, but it just so happens that they’re in an eccentric orbit, meaning their orbits aren’t very circular. The relentless ebb and flow of these orbits produce gravitational effects deep within the cores of these planets, generating heat. This phenomenon, known as “tidal heating” has been observed around Saturn’s moon Enceladus and Jupiter’s moon Europa, allowing vast oceans of warm liquid water to exist under an icy crust. It’s this tantalizing possibility that prompted a research team from the Planetary Science Institute to estimate the chemical and material distribution within each of the seven TRAPPIST-1 planets. 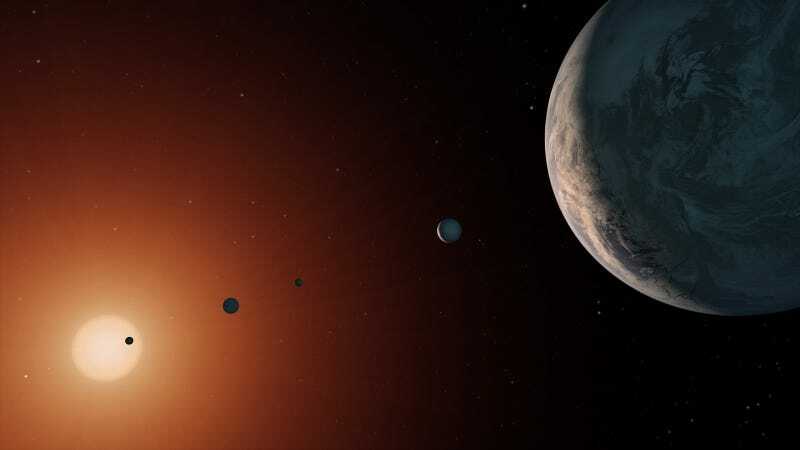 The researchers determined that planets d and e “are the most likely to be habitable,” on account of their moderate surface temperatures and levels of tidal heating. Also, planets d and e don’t exhibit wild fluctuations in heat that could prompt a runaway greenhouse gas situation, like the one we see on Venus. 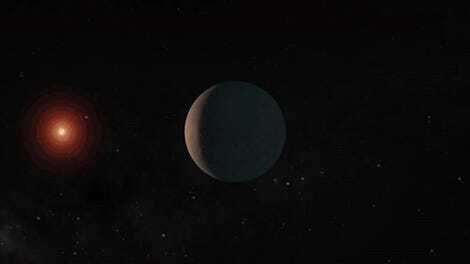 Remarkably, planet d may be a water world—a planet completely covered in liquid water. Planet e is likely covered in ice, but it could harbor an ocean of liquid water underneath its frozen surface. As for the other planets, they’re not so hospitable. Planet b is a ball of lava, and planet c likely features a rocky surface that erupts silicate magmas, similar to Jupiter’s moon Io. The researchers weren’t able to determine the situation for planets f and g, saying the tidal forces might actually be too small to produce under-ice liquid oceans. But planet f, like planet e, may indeed be covered in ice, so if some tidal heating exists, that bodes well for its potential habitability. Avi Loeb, an astronomer at the Harvard-Smithsonian Center for Astrophysics who wasn’t involved in the new study, says these results are “not firm” given how much we don’t know about the masses and sizes of the TRAPPIST-1 planets. “This may explain why we find ourself around a star like the Sun and not much closer to a dim star like TRAPPIST-1, which has only 8 percent of the mass of the Sun,” says Loeb. Loeb is right when he says the paper is based on some key unknowns, but he is discounting the potential for life to emerge in the warm waters produced by tidal heating. Here in our Solar System, Enceladus and Europa have emerged as tantalizing candidates in the search for life. In the case of Enceladus, scientists have determined that the moon already is in possession of the key building blocks for life. Sure, the planets of TRAPPIST-1 may not feature complex, land-dwelling creatures, but maybe there are small organisms trapped beneath the ice.